Let the Wookie win. BCBG's Fall 2014 collection yesterday was all about the fur. Big collars, big muffs, big, over-sized coats that seem exactly what you would want this week with the impending snowstorm. For a West Coast designed label, the abundance of cold weather choices were surprising. Either that, or the design team came to NYC for a visit and was shocked into a reactionary collection. It wasn't all fuzzy and huge though. The other consistent theme was the use of wide stripes and color blocking. 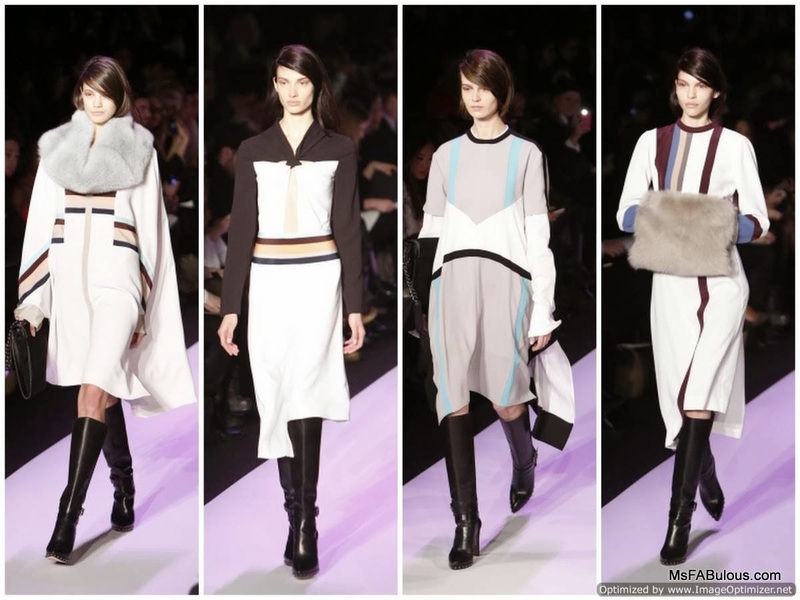 The looks followed a very cool palette of blue, burgundy, black, tan and white on long silhouettes. None of the outfits were very fitted. I guess that saves a lot of time in fittings and pattern-making if nothing needs to be precise. Maybe that is the secret to producing a fashion collection when you come from California? Big tall black boots were the footwear of choice. Handbags were slightly evolved from last season's simple large clutches to simple large clutch with gussets pressed out and thick chain straps. Fur, faux or otherwise is clearly here to stay for chilly seasons to come. Pretty soon, even Bigfoot will be chic.